Natural orifice transluminal endoscopic surgery (NOTES) is a recent concept, originating as an extension of interventional endoscopy, but more recently being adopted by laparoscopic surgeons and surgical endoscopists as a less-invasive form of laparoscopy. The first published accounts of what would come to be known as “NOTES” (a term coined by the 2005 joint committee of the American Society of Gastrointestinal Endoscopy [ASGE] and the Society of American Gastrointestinal and Endoscopic Surgeons [SAGES] ) appeared in 2004. In 2005 and 2006 there were only a handful of papers published on the subject but activity in the form of meeting abstracts and presentations was notable. Starting in 2007 there has been a deluge of papers published on NOTES – 114 in the past 20 months alone ([Fig. 1]). Fig. 1 The frequency of peer-reviewed publications on natural orifice transluminal endoscopic surgery (NOTES) since January 2007. 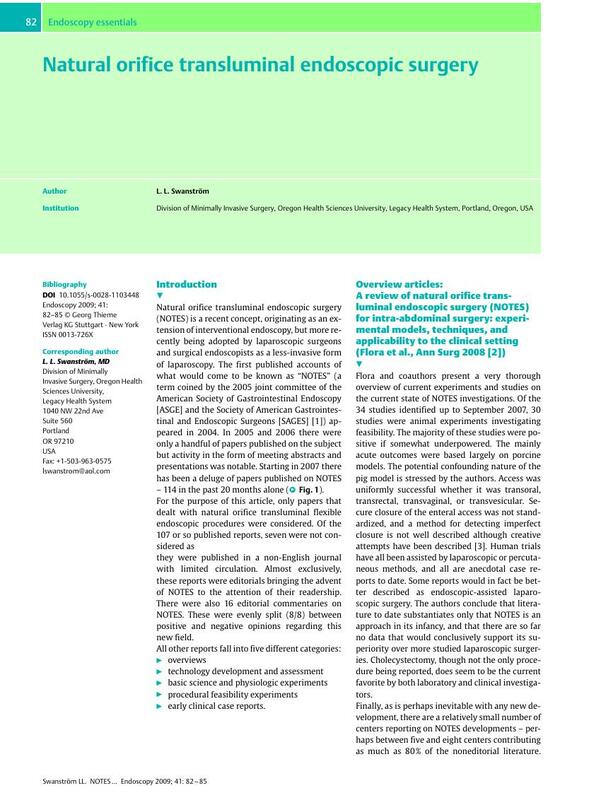 For the purpose of this article, only papers that dealt with natural orifice transluminal flexible endoscopic procedures were considered. Of the 107 or so published reports, seven were not considered as they were published in a non-English journal with limited circulation. Almost exclusively, these reports were editorials bringing the advent of NOTES to the attention of their readership. There were also 16 editorial commentaries on NOTES. These were evenly split (8/8) between positive and negative opinions regarding this new field. overviews technology development and assessment basic science and physiologic experiments procedural feasibility experiments early clinical case reports.